This is a new series but definitely not a debut novel for Sheila Connolly (she is already a nest selling author). I personally haven’t read any of Connolly’s books but I was intrigued by the summary of this one and the fact that it was a brand new series. Not going to lie the fact that it said ‘Victorian’ in the series title also was a contributing factor. I love all things Victorian and when I saw it in the title I was immediately saying ‘sold’ loudly in my head. Katherine Hamilton’s goal in high school was to escape from her dead-end hometown of Asheford, Maryland. Fifteen years later she’s got a degree in hospitality management and a great job supervising every aspect of the day-to-day operations of a high-end boutique hotel on the Baltimore waterfront. Then her high school best friend asks her to come talk with the town leaders of Asheford, but she won’t say why. Kate can’t cut her last link to her past, so she agrees to make the short trip across the state to Asheford. But a few days later Kate receives a call from the police–Cordelia has been found dead on the mansion property, and Kate is all-but certain that her name is high on the suspect list. 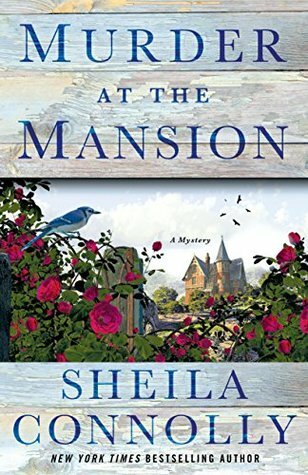 She finds herself juggling the murder investigation and her growing fascination with the magnificent old house that turns out to be full of long-hidden mysteries itself. Kate knows she must clear her name and save her town–before she ends up behind bars (summary from Goodreads). The writing in this book is excellent and practiced. It’s evident that Connolly is a seasoned vet when it comes to writing and mysteries. Everything was well thought out and made logical sense. There wasn’t the jumping around or trying to decide what the central theme of the book is going to be, that some newer authors have. With Connolly, she knows what she’s about. But as with any new series, there are a lot of things happening in this book. There are a lot of characters and plot points to set up as well as the hierarchy of the town and it’s people etc. So just be prepared that there is a lot of set up and ground laying in this book. I also appreciated the attention to detail regarding the historical period. While this book isn’t necessarily a historical fiction book, there are historical elements, especially in regard to the house. The historical elements, while not the focus, added to the story and made the town interesting and as a historian who loves the Victorian era and did her thesis on the Civil War, this book was a thrill to read. I suspect that the town will continue to be a focal point in future books. I liked how the author kept that door open because it gave me anticipation for the setting of future books. This was a good read for me. It did take me a few chapters to get into the overall story but for the most part I found myself interested and eager to keep reading. However one thing I would like to note…..I am not a fan of the cover art. It doesn’t stand out in any way to me. It’s so non descriptive that I feel like it could be for any book. In her other book series, the cover art had a lot of charm to it and I felt disappointed that this book didn’t share the same. Overall this is a fund little mystery read. I loved the polish of the details and overall story. If you are a cozy mystery fan, then you might want to give this little gem a try!